We Get you In Today! Confirm your Beachside Chiropractic appointment Now! Please use the form below to book and confirm an appointment Monday, Wednesday, Thursday 8am-12pm. After you fill out the form below all you need to do is show up at the time we have set aside for you. If you can’t make it or need to change the time please call so that we can offer your spot to another patient. For an Instant Appointment use our phone below to get an immediate appointment after hours. 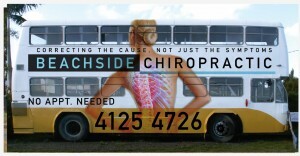 Look for the Beachside Chiropractic double-decker bus! Locating Us: Look For the Double-Decker Bus! When facing the bus the entrance to Beachside Chiropractic is around the building to the left. You will see the driveway that enters from Bideford Street. Entrance is sliding wooden door on the right (Door slides left). If locked please call and I will come to your aid. You can always give us a call for driving directions at (07) 4125-4726.